An American Indian woman may have been the first native American to set foot on European soil, brought to Iceland by the Vikings several centuries before Christopher Columbus set foot on the Americas according to a new analysis of DNA and genealogical records of native Icelanders, reports AFP. The analysis found that some 80 Icelanders in four contemporary families hailed from ancestors who lived in Iceland in 1710 and 1740. They carry a newly-discovered variant of mitochondrial DNA called C1e -closely related to other C1 variants that are unique to the first Indians to settle in America 14,000 years ago. DNA C1e has been identified in 11 contemporary Icelanders, and traced back genaeologically. 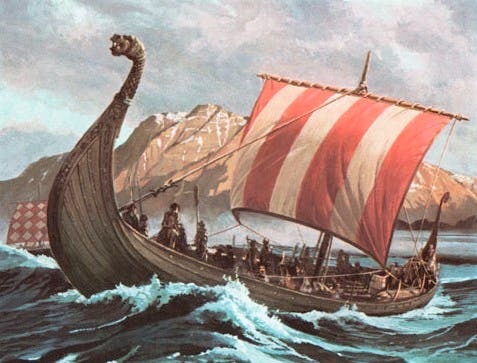 Because the variant is in mitochondrial DNA, which is only passed down the mothers' line, the first American Indian arriving in Iceland must have been a woman, and must have arrived around the year 1000,"
"As the island was virtually isolated from the tenth century, the most likely hypothesis is that these genes corresponded to an Amerindian woman who was brought from America by the Vikings around 1000," says lead researcher, Carles Lalueza-Fox of Spain's Institute of Biological Evolution in Barcelona, in a press statement from Spain's national research council, CSIC. Lalueza-Fox analysed the DNA in collaboration with Decode Genetics, an Icelandic company in Reykjavik that stores genetic records of the Icelandic population. "It was thought at first that (the DNA) came from recently established Asian families in Iceland," CSIC researcher Carles Lalueza-Fox was quoted as saying in a statement by the institute. "But when family genealogy was studied, it was discovered that the four families were descended from ancestors who lived between 1710 and 1740 from the same region of southern Iceland." Casey Kazan via newscientist and AFP.